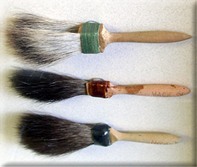 We love our brushes, and love to hear how you use them! Or if you want to check us out in person, follow the map above. Although the Andrew Mack and Son Brush Company was founded in 1891, its history goes back to 1865. It was during that year that J.J. Deal founded his wagon and buggy factory in the small village of Jonesville, Michigan. The Deal factory quickly gained the reputation of building the finest carts, wagons, and carriages in the Midwest. The products were first class in every detail – even the paint! It was with this emphasis on quality that the Mack Company made its contribution for several years prior to 1891. 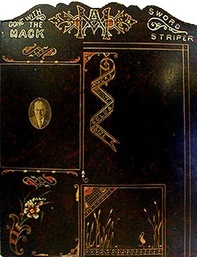 Andrew Mack (1860 – 1946) had been the head striper at the Deal Company Andrew was a true perfectionist and he had never been completely happy with the quality and performance of the striping brush furnished by the Deal Co. Since Andrew Mack died in 1946 (at the age of 86), the early history of his company is very sketchy at best. We know that he operated his company out of several buildings and homes prior to his death. We understand that in the 1930’s there were over 30 ladies working for him full time manufacturing just the pinstriping brush. Of course, one must remember that this was the heyday of pinstriping (no tape, rollers, spray or air brush guns were on the market at that time). Andrew’s son, Glenwood, was involved in the family business on and off from 1911 until he took over full ownership in 1946 upon Andrew’s death. The years of experimentation for the Mack Company, were from 1946 until 1961. Glenwood spent countless hours in quality control and time studies. He entered the photographic market with a brush that was used in cleaning camera lenses. He contracted artist and sign writer brushes from a company in New York called “Art & Sign”. He developed this art and sign writer business until it accounted for about 25% of the overall sales. However, by 1961, Glenwood was 72 years old and it was time to step down and enjoy life. 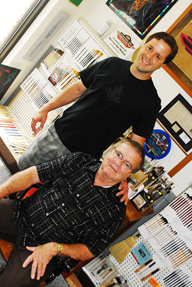 Jon M. (Mike) Fast, a friend of the family, purchased the business in 1960. He was a junior at the University of Michigan Business School at the time, and has continued as the president of the business to the present date. Sales, through inflation and growth, have increased many times over the years, and the Andrew Mack and Son Co. is more viable and diversified now than ever before. The company continues as the world leader in quality pinstriping and touch up brushes, but they have also branched out into many other allied areas. One of the fastest growing areas and also the most gratifying has been developing new and unusual brushes for the sign painter. The squirrel hair comes from the cold regions of the Siberia and northern China. Many attempts have been made to raise squirrels or use the tails from northern Canada, but the quality just isn’t the same! On a side note, our brush, as well as many other artist and sign writer brushes, have always been labeled ‘Camel Hair.’ This couldn’t be further from the truth. There is no such thing as ‘Camel Hair’. It was a name given to squirrel and other animal hair a long time ago. Most of us have been afraid to drop the label for fear of losing you as a satisfied customer.